Every time I sit down to write one of these posts I take an opportunity to reflect on where we are. When I first started this blog, the beer community was in its infancy. Half Pints was the predominate craft brewery, and remain to this day the original. We now have more breweries than I know what to do with. And I love it. Today I write about an fun partnership with Brandon University. Nonsuch brewmaster, and Brandon University Alumnus, Mark Borowski has brewed a special beer for Brandon University’s 50th anniversary. This “Marzen Style” beer is, like most Nonsuch Beers, a cranked up version of the Marzen style. It is somewhat auspicious that I am posting this write-up today. NONSUCH HAS A SPACE. They announced it this morning. They will be moving into the old Peg Beer Company site at 125 Pacific Avenue. This is a happy and a sad day. I am happy for Nonsuch to finally have a place to call there own. At the same time, this means there won’t be a return of Peg. This “Golden Ale” brewed for the “Golden Anniversary” of Brandon University is crafted from a recipe inspired by a Marzen, a German festival beer that is traditionally served at Oktoberfest. Before refrigeration, it was nearly impossible to brew beer in the summer due to the hot weather and bacterial infections. Brewing ended with the coming of spring, and began again in the fall. Most were brewed in March (Märzen). These brews were kept in cold storage over the spring and summer months, or brewed at a higher gravity, so they’d keep. Märzenbier is full-bodied, rich, toasty, typically dark copper in color with a medium to high alcohol content. 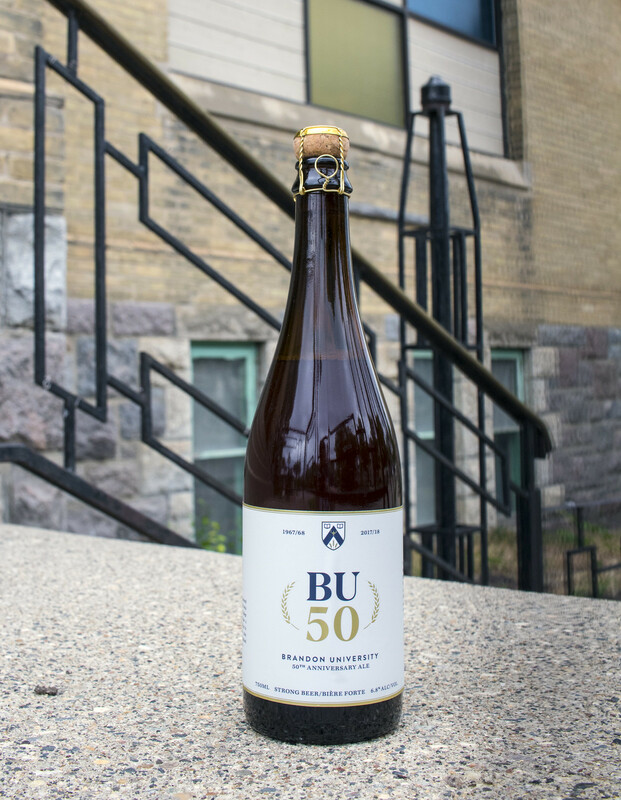 According to the description, the unique BU50 Anniversary Ale uses a hybrid yeast to brings out more crispness, and further enhanced by the use of Saaz hops. The result is a refreshing and well-balanced strong beer that comes in at 6.8% ABV — intentionally chosen as a nod to 1968, the year the first graduates of Brandon University received their degrees. Previously, graduates from Brandon College received degrees from other institutions. Appearance – Pours a clear golden/honey colour with a foamy head. Smell – There is a biscuit malt character to the nose along with some hints of caramel and a bit of grassy hops. Taste – This was a rather sweet beer. The sweetness from the malt came through strong and was only slightly cut by some crisp bitterness on the finish. Mouth Feel – Medium bodied with good carbonation and a nice dry finish. Overall Thoughts – Nonsuch is known for making ramped up beers. This was no different. The malt character really shone in this beer and, while I found it to be on the sweet side, it did have a crisp finish. I think that it hit on the characteristics one would expect to find in a Märzen while still maintaining something special that is worthy of the celebration. Do I like it? – I did like this beer. I found that it brought a nice malt character. I found it to be a bit sweet for me, but I was able to move past that and enjoy it. I think this type of collaboration is really fun and I hope we see some more of it. The price tag on this beer, $19.68, is rather high. But, we know that Nonsuch’s overhead for there beers is already pretty high and if we consider they are donating a portion of this to the Brandon University’s BU Foundation, it makes a bit more sense. The beer is already sold out in most of Brandon. Luckily, Nonsuch is currently brewing their second batch of the beer which should be ready in about a month. There are hopes it will be sold at rural Liquor Marts in Western Manitoba and eventually Winnipeg Liquor Marts as well. This years’ Flatlander’s Beer Festival was by far the best one to date. With 72 booths and over 240 beers, it was the largest beer festival we’ve held in Manitoba. The number of beers isn’t always important, but the quality, variety and style variations made this year pretty darn awesome. Not only that, the local breweries were out in force and brought their A-game, giving every single one of us a reason to be proud. I had a unique opportunity this year. I attended all three sessions of Flatlander’s in different capacities. On Friday night I had the joy of being a patron, enjoying around 70 unique beers. On Saturday I participated in the “ask a beer geek” initiative and had a great time answering questions and helping guide people towards beers. Then, on Saturday night, I had the opportunity to pour for Brewsters’ Brewing Company. Each of these experiences brought a different perspective of the festival and dang, it was fun. As a patron, I was incredibly impressed with how well organized the beer festival was this year. They had multiple entrances that split up the crowd, they used the concourse as well as the ice, which helped spread the crowd out to make the beers more accessible, and they had fantastic volunteers who did an awesome job helping guide people where they wanted to go. For me, the most exciting part was the fact the first 9 booths were all local. Barn Hammer, Farmery, Fort Garry, Half Pints, Brazen Hall, Nonsuch, Torque, One Great City and the Winnipeg Brew Bombers were there with a lot of fantastic beer. As I said above, these local breweries brought their A-game and provided a fantastic opportunity to not only try a huge number of delicious beers, but also connect with the brewers and breweries. The local booths were packed all night long with patrons drinking, chatting, and buying the merchandise. I got me a Torque hat, a Barn Hammer hat and a One Great City shirt… eventually I’ll collect them all! I can’t wait to try more of the local stuff as it starts to trickle into the market. From what I had the opportunity to taste (every single one) I am excited to continue to support local brewers. This is what I was writing about last year, what I’ve been writing about since I started this blog: We are finally seeing the craft beer community in Manitoba grow…and it’s good. As a beer geek, I had the opportunity to answer questions people had about beers, hand out some cool swag to patrons and help guide people who didn’t really have a plan. It was a great opportunity to use some of the knowledge I’ve gathered to help others better understand and enjoy beer. I found many people are becoming really well-educated themselves, and that people were just as excited about the local beer as I was. While I didn’t have many questions besides “Where is the local stuff” or “Where am I?”, I did have some fun ones. One group had tried a few beers and asked “What is it about these beers I don’t like?” which was a fun one to answer. Others were curious about the use of nitro in One Great City’s Milk Stout, or what a Randall was. Overall, I was working with some really smart people and had a great time getting to meet a lot of new folks, help them enjoy their beer, and learn a little bit more myself from talking with brewers. This gave me a good barometer for people who knew something about beer and those who did not. While two years ago Flatlander’s seemed to have a large number of people asking “what’s an IPA?” this year I didn’t have a single person ask that. There will certainly always be room for people to learn more about beer, but the amount of knowledge people showed Saturday night was great to witness. I’m so happy Manitobans are increasingly embracing craft beer, are excited about new beers and local beers, and want to try something they’ve never had. Talking with Don, a man who has been in the beer industry for close to 20 years, was fantastic. This guy really knows his beer and his product and I really hope that we see some of it come to Winnipeg. The Honest Paul IPA was delicious and I’m a sucker for a good Coconut Porter. We’ve already got their Brewmaster Collection in Liquor Marts, but we will also see a Peach Ale coming to town for the final flight of Coast to Coaster. Overall, I had a fantastic time at the beer festival. It helped build excitement for the local breweries, something I’ve been working hard to do, and gave people their first sampling of what is to come. Next year’s festival will be even better as the breweries here this year – most with the help of Half Pints – will be open and brewing on their own systems. They will have grown and we will have, hopefully, even more new breweries giving us a first taste side-by-side with those from this year. While we had nine local booths at this year’s festival, I really hope to see us take up 20 booths next year. So, fellow beer fans, I encourage you to get out and enjoy local beer this summer. Of the new folks, Barn Hammer is already sending beer out the door; you can find it at Fools & Horses and Earls right now, and Torque will hopefully be coming up close behind. Many of us have been clamouring for more craft beer so now it’s time to put our money where our mouth is – and also beer where our mouth is. It’s time to get out and show these places that we will support them. Let’s end today’s post with a question. If you attended Flatlander’s, what was your favourite beer? Answer in the comments below. Last night I had the opportunity to attend the Manitoba Brewers’ Association (MBBA) meet and greet event that was held down at Fort Garry Brewing Company. The event was incredibly well attended and it was nice to see so many people come out to support not only local craft beer, but the Winnipeg Jets True North foundation. This was the kickoff, if you will, for the Flatlanders’ Beer Festival happening this weekend. If you don’t have your tickets yet, they are still available here. The event provided an opportunity to give a try to some of the beers the local breweries have been working on. Most only brought one to sample, leaving room for excitement at flatlanders, but the beers that they brought were all quite good. Torque brought their American Stout, One Great City their Pale Ale, Barn Hammer brought their Double IPA, Nonsuch had their Saison, Half Pints had the MBBA collaboration brew and a Coconut Milk Stout, and Fort Gary had their Black Pearl and Buddha Lager. The big surprise of the night was the new comer, Brazen Hall Brewery and Kitchen, who are going to be opening at the site of the Round Table. It was an opportunity to meet them and to have a taste of their first beer, a Best Bitter. Kristjan Kristjansson, who I hope to sit down with again, was saying that they want to combine his Icelandic heritage with the British heritage of their head brewery, Jeremy Wells. The bitter was nice and I’m excited to hear more about them. While this was just a first opportunity to try some of these beers, I was pretty impressed with what I tasted and I’m excited to be able to try the beers as a final product. So, I hope that you will all try to make it to the Flatlanders’ Beer Festival this weekend. I’ll be there Friday night enjoying myself, Saturday afternoon as a Beer Geek (come ask me questions) and Saturday Night helping out pouring for Brewsters (come by and say Hi). On one final note, the Manitoba Bartenders Guild has organized a self-guided brewery tour event that sounds like a lot of fun. I’ll be going along with them and anyone else interested in joining, come on out. See the image below for details. It should be fun. Thanks for reading as I follow the changing climate of beer here in the province of Manitoba, I’m pretty excited to keep following these, and other, breweries as they start moving closer to opening their doors. It’s been a while since I had the chance to write a post. I did a quick update last week but work and being sick have kept me from posting as regularly as I’d like. Luckily, I’m back at it and I’ve got a good one today. With the Meet Your Local Brewer event, Barn Hammer starting to brew, and Flatlander’s coming up, it’s a great time to be a beer drinker in Manitoba. We are finally going to get our first taste of what is to come and I am going to make sure I get as much as I can. I had the opportunity to sit down with Matt and Mark from Nonsuch Brewing Co. the other day and learn a bit more about their team and their vision – one that certainly takes a step outside the norm with their very clearly defined plan. First, who is Nonsuch? There are four guys who are behind the brewery all with various backgrounds, expertise and brewing experience but with one shared vision: to brew high quality Belgian and European style beers. The four of them are proud Manitobans, something that they all feel plays a huge role in their lives. It is the reason they have chosen “Nonsuch” as their name, because of it’s strong connection with Manitoba’s History. Matt Sabourin is the one who originally came up with the idea of opening a brewery. With an operations background – having been a production manager at Frantic Films before moving into the French film industry and finally spending the past 5 years as the operation manager at his parent’s company – he’s developed the entrepreneurial spirit. Opening a brewery for him has been a no-brainer. He’s spent the past five years learning all he can about brewing through homebrewing, all with the goal of opening Nonsuch. While Matt originally came up with the idea of opening a brewery, it was the whole team who developed the vision and concept of focusing on Belgian and European beers. That’s where the rest of this team comes in. With Matt filling the role of President, his good friend Ben Myers will act as VP and focus on the sales and marketing aspects. Ben has a lot of experience as the Product designer for Robots and Pencils. An artist, designer and developer, Ben will bring his creativity and experience to the team. The head brewer is Mark Borowski. This is someone Matt knew he wanted to tap on the shoulder; when he finally sat down with Mark they shared the same vision, almost verbatim. Mark is a qualified teacher who has worked across North America. After getting bored with teaching, he went to film school in Calgary, returned to Winnipeg for a brief period before heading to Victoria. He finally made his way back to Winnipeg, started a family and began brewing beer. Now he’s going to take that brewing experience, including numerous medals at competition, and put it into the brewing of beer for Nonsuch. Finally, we have Tyler Johnston who will act as brand manager. He’s already done an awesome job developing the website and will continue to work with the rest of the team from his new home in Saskatchewan. Matt has been looking to open a brewery for the past four to five years; he got into homebrewing with a full brewery as his compelling end goal. The focus on Belgian and European styles became more evident about two years ago. Matt has always enjoyed wine and finds Belgians, sours, and big beers are similar in complexity, flavours and aging. While Matt has been planning Nonsuch for some time, the first meeting of “the team” occurred in November of 2015. Even though they’ve only been working on this major project 17 months, they already have a location in mind. The site’s identity is under wraps for now, though they did say they want to connect with the history of Manitoba (hence the name) and feel being in the Exchange near the downtown is important for them. While they have no confirmed beers to announce, we will get the chance to taste a high ABV (8%) saison and a mid ABV (6.5%) kolsch at Flatlander’s. Mark has multiple award-winning sours under his belt, and given that both he and Matt named sours (Flanders Red and Sour Brown Ales) as a favourite style, I think it’s safe to assume we will see that. They did say we can expect the gambit of Belgian styles from brown ales to quads. The team is going to use the “lean-approach” to the brewery. This approach puts an emphasis on the business model over the business plan and encourages a process of customer discovery, development and iteration to achieve the right fit in the market. Given this, they are looking for the most efficient way to get brewing. They’ve selected a pilot system that can carry them forward. Matt said they want to validate their product and then expand, but overall they will remain relatively small. Mark said he doesn’t want to go beyond 5 barrels (596 litres) because he prefers to make beer in smaller batches. This gives Mark more control over the beer and he strongly feels you can brew better beer in smaller batches. They want to find the happy middle between homebrew and big market. When their beer does come to market it will be in 750ml corked bottles to allow those who love to cellar beer to do so. There will likely be a growler bar, but they are a bit unsure if all beers will be on it given many will have a high ABV. A tap room is in the plans but this will likely be part of their second phase of expansion in five years. They are also considering using the champagne method to carbonate their beers, but this is still undecided. They also have some other plans in the works, but those they want to keep as a surprise for now. I always ask about the experience in opening a brewery here in Manitoba. So far, the process has been great and they have had a lot of support. Their experience with the brew hub has been great, as has the MBLL. They are a bit concerned about the permit process but are hopeful everything will go well. The biggest support they’ve received so far has been from Half Pints who has given them, as well as many others, the opportunity to produce beers at their brewery for Flatlander’s. It is really thanks to Half Pints we will get the chance to try many of these new breweries and I think they deserve huge props for providing this support. What is going to separate Nonsuch from the other breweries opening? The team wants to stay thematic and brew exclusively Belgian and European style beers. The look and feel of the entire brewery is going to connect with the concept of premium: everything will be done with the best possible product. They will be the only brewery using mineral water to brew instead of city water. Matt says people will know from the bottle, the brewery and the beer that they are out to make the best possible product. People should expect “our darndest of efforts” to make the best possible beers and give the best possible experience from start to finish. They want everything to be exceptional. If you’re not already going to the “Meet Your Local Brewer” event, be sure to check out the Nonsuch team at Flatlander’s – they’ll be at both of these events and it will be your chance to ask any other questions you might have, and of course, taste their beers. I’ve got an update from Barn Hammer I’ll be posting next week sometime, so please watch for that. Again, try to get out to Flatlander’s if you can. If you do, I’ll see you there.